Everyday, the AFFotD office brings in the most exotic, unhealthy American meals we can think of. For example, today we ate Bald Eagle burgers. They were surprisingly gamey, but we made up for it with a really inventive Dijon Mustard recipe. We won’t tell you what’s in it, but we will tell you that it once was alive, and still is incredibly endangered (let’s just say it rhymes with Shcondor Eggs). 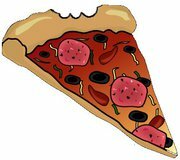 Needless to say, we were fairly impressed when, over sixteen years ago, Pizza Hut tried to blow our mind by selling the stuffed crust pizza, with cheese straight up crammed into the crust of the pie. That was a game changer, folks. Percentages of pizza ingredients going uneaten plummeted. Calorie intake skyrocketed. There were suddenly thousands of backwards pizza eating sightings. So when we were going through our daily lunch options, and Pizza Hut came up, we discovered something unexpected. Something wonderful. Something…well, something damn amazing.